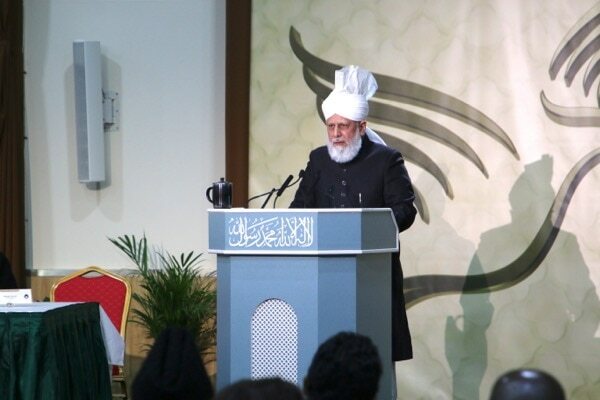 With so many problems in the world today leading to the potential devastation of both human lives and this planet, His Holiness, Hazrat Mirza Masroor Ahmad(aba), draws our attention to the kind of legacy we are leaving our children. 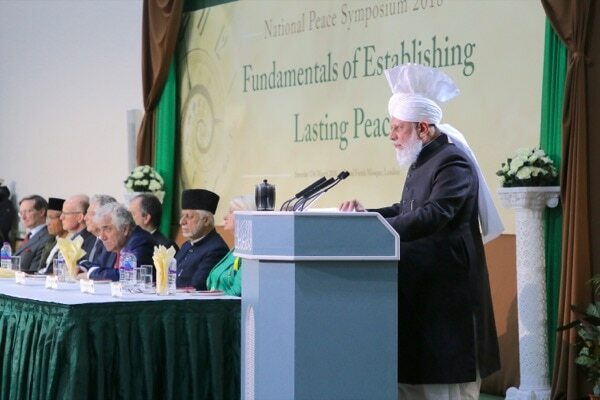 Every year, the Ahmadiyya Muslim Community holds a Peace Symposium, featuring a keynote address by His Holiness, Hazrat Mirza Masroor Ahmadaba, Khalifatul Masih V and worldwide head of the Ahmadiyya Muslim Community, where he discusses the vital issues that harm world peace. This year, His Holiness focused on the links between poverty and income inequality, global security and climate change, while also explaining that Islam’s teachings lead to peace, not to violence. The annual Peace Symposium is also the occasion for the awarding of the Ahmadiyya Muslim Prize for the Advancement of Peace. This year’s award winner, Dr Leonid Roshal of Russia, chairman of the international charity Fund to Help Children in Disasters and Wars, was honoured for his work in helping the world’s youngest and most vulnerable victims.This year’s symposium drew hundreds of guests, including government ministers, ambassadors of state, members of both Houses of Parliament and various other dignitaries. Read His Holiness’ important and timely message on the following pages. ‘Bismillahir Rahmanir Raheem – in the Name of Allah, the Gracious, Ever Merciful. 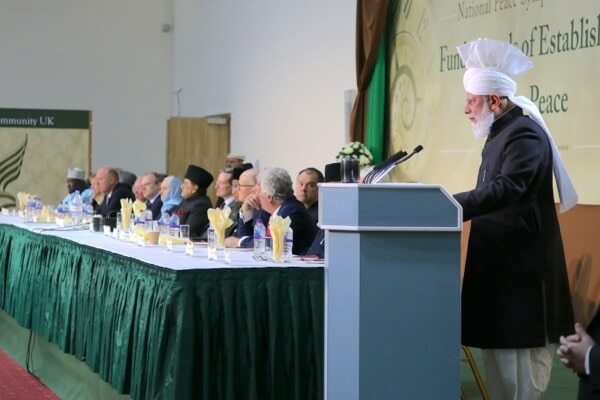 His Holiness addresses attendees at the 15th annual Peace Symposium. First of all, I would like to thank all of our guests, for joining us here at our Annual Peace Symposium. 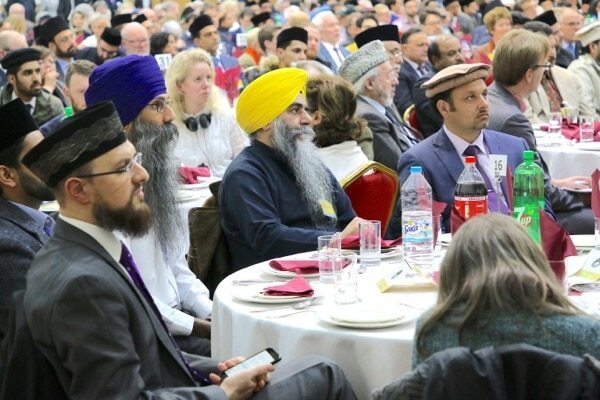 For the past 15 years, the Ahmadiyya Muslim Community has been organising and hosting this Peace Symposium, for the sake of promoting world peace. 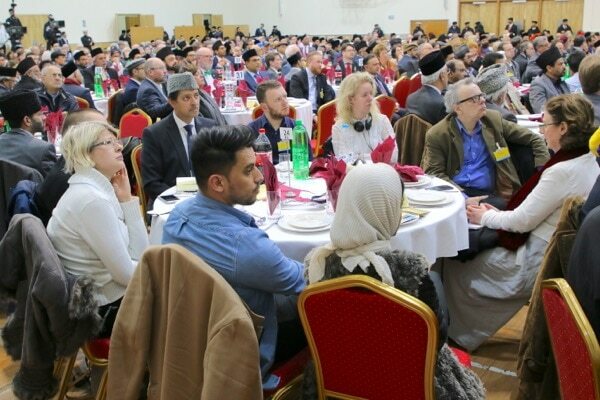 Perhaps, some of you may question the benefit of us organising this event each year, given that the peace of the world, both in Muslim countries and elsewhere, has not improved at all during this time; rather, it has deteriorated. Much of the world has been gripped by increasing division, hate and injustice. Society has become polarised, wars have taken place, nations have threatened one another and inequality has intensified in both the developing and the developed world. Given this situation, your question is quite valid; however, our faith demands us to try and urge people, in all parts of the world, whether rich or poor, whether powerful or oppressed, whether religious or irreligious, towards peace and justice. Hence, we will continue to play our role in making mankind realise its duty towards respecting and honouring basic human values. The core teachings of Islam are to fulfil the rights of our Creator and to fulfil the rights of our fellow human beings. With these brief words of introduction, I now wish to take this opportunity to speak about some matters that I consider to be of great importance in these turbulent times. have debated and campaigned about, is climate change and specifically a reduction in carbon emissions. 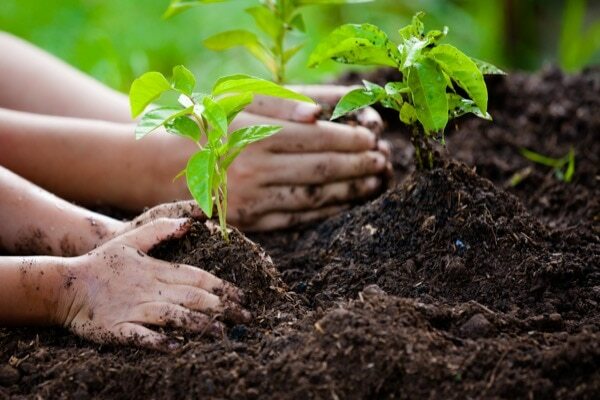 Certainly, striving to protect the environment and to look after our planet is an extremely precious and noble cause. Yet, at the same time, the developed world, and especially the world’s leaders, should also realise that there are other issues that must be tackled with the same urgency. People living in the world’s poorest nations do not concern themselves with the environment, or the latest figures on carbon emissions; rather, they wake up each day wondering if they will be able to feed their children. Their economic plight is truly desperate and their poverty levels are far beyond our comprehension. For example, there are numerous countries where the majority of citizens do not have access to clean drinking water and are forced to survive by using dirty pond-water to fulfil their basic needs. Even that too is not easily available; rather, women and children have to travel each day, for miles on end, to collect water for their families, which they carry home in big vessels, balanced on their heads. We must not consider such hardship as other people’s problems. Instead, we must realise that the result of such poverty has severe implications for the wider-world and directly affects global peace and security. The fact that children have no option, but to spend their days collecting water for their families, means that they are unable to go to school, or to attain any form of education. They are stuck in a vicious cycle of illiteracy and poverty that is seemingly endless and hugely damaging to society. Today, their poverty and hardship is compounded by modern technology, through which, even people living in war-torn or deprived parts of the world, are able to see the comfort with which people in developed countries are living and the opportunities that exist for them. Witnessing the great disparity in their circumstances, compared to others, is cultivating further agitation amongst the local people and these frustrations are being preyed upon by extremists, who entice the impoverished with financial reward and by promising a better life for their families. Similarly, the targeting of illiterate youth means that the extremists have free rein to radicalise and brainwash them. The extremists take advantage of the fact that the rulers of those countries have, more often than not, failed their people. Most regrettably, the ruling classes, in war-torn or deprived nations, are more often concerned about preserving their own status and power, than helping alleviate the suffering of their people. The result is that those who have nothing, come to view their own corrupt leaders with contempt and see the world’s major powers as the enemy. Tragically, we are seeing the horrific effects of this in Muslim countries as well, and it is after observing the desperate state of their countries of origin, that some Muslims brought up in the developed world have been radicalised and have perpetrated horrendous terrorist attacks here in the West. Hence, I firmly believe that if we truly wish to protect our world and to ensure we leave behind a legacy of opportunity for those who follow us, it is essential that every effort is made to raise the standards of the developing world. Poor nations must not be looked down upon, rather we should consider them as part of our family – our brothers and sisters. By helping the developing nations stand on their own feet, and by giving their people opportunities and hope, we will actually be helping ourselves and safeguarding the future of the world. 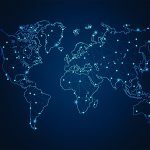 Otherwise, we are already seeing that the poverty and destitution in the developing world is negatively affecting the rest of the world as well. Audience members and invited guests listen attentively as His Holiness delivers the keynote address. Furthermore, as a result of recent terrorist attacks and widespread immigration to the West, there has also been a dangerous rise in nationalism in many Western countries, evoking fears of the dark days of the past. It is particularly disturbing that far-right groups have become increasingly vocal, and have seen their membership rise and have even made political gains. They too are extremists, who seek to poison Western society, by inciting the masses against those who have a different colour of skin or who hold different beliefs. In addition, the rhetoric of certain powerful world leaders has become increasingly nationalistic and belligerent, as they have pledged to put the rights of their own citizens above all others. I do not dispute the fact that it is the responsibility of governments and leaders to look after their own people and to protect their interests. Certainly, as long as the leaders act with justice, and do not infringe upon the rights of others, attempts to better the lives of their citizens is a great virtue. However, policies that are based upon selfishness, greed and a readiness to forfeit the rights of others are wrong and a means of sowing discord and division in the world. Moving on, another issue is the international arms trade. Today, the world considers itself far more civilised than at any time in the past, yet in 2018, there are countries that are being demolished and annihilated by weapons that can only be categorised as inhumane. In countries like Syria, Iraq and Yemen, government forces, rebels and terrorist organisations are fighting one another. Despite their divergent interests, they all have one thing in common – that the vast majority of their weapons have been produced externally in the developed world. Quite openly and proudly, the major powers are trading arms that are being used to kill, maim and brutalise innocent people. Regrettably, such nations are focused only on attempts to boost their economy and to maximise their nation’s capital, without pausing for thought at the consequences. They desperately seek to attain the largest possible contracts to sell destructive weapons that, once fired, do not distinguish between the innocent and the guilty. They proudly sell weapons that make no exception for children, women or the infirm. They shamelessly sell weapons that engulf and obliterate towns and cities indiscriminately. Whilst the economies of the selling countries may attain short-term benefit, their hands are covered in the blood of hundreds of thousands of people. Countless children are seeing their parents being killed in the most inhumane fashion and all they can do is wonder why their parents have been taken away from them. Thousands of women are left widowed, hopeless and vulnerable. What good can come of such devastation? All I see is a generation of children being pushed into the arms of those who seek to destroy the peace of the world. When a young child or a teenager, sees their parents taken away from them, in the most barbaric way, who can blame them for reacting? I mentioned before that extremists target those immersed in poverty and they are also targeting those children or youths who have been brutalised by war. They recruit such youngsters in the knowledge that their minds are not yet mature, and are easily manipulated, into seeking bloody revenge through terrorism. Instead of being in school, getting an education, so that they grow into decent, law-abiding citizens, the only education an entire generation of children is getting, is how to master grenades or rocket launchers, how to do suicide attacks and how to wreak havoc in the world. Moreover, some countries are unnecessarily involving themselves in conflicts taking place thousands of miles away, by deploying their own soldiers or by pounding foreign lands with airstrikes. In many instances, it seems that the world has not learned from its past mistakes. It is widely accepted that the Iraq War of 2003 was unjust and based on false pretences, whilst Libya has descended into chaos and become a hotbed of extremism, since Western powers took action there several years ago. Despite this, big powers have not learned a lesson from this. Cities and towns have been razed to the ground. Thousands of buildings have reverted to dust. At the beginning, I mentioned that a major focus of the international community is climate change and a desire to keep the air that we breathe clean. Is there anyone who thinks that heavy bombardment has no effect on the atmosphere? Furthermore, if peace ever does prevail in the war-torn countries, their towns and cities will have to be rebuilt from scratch, and this in itself will be a huge industry that will cause an increase in harmful emissions and pollution. Thus, on the one hand, we are trying to save the planet, yet with our other hand, we are senselessly destroying it. In light of all of this, I firmly believe that world powers are being blinded by short-sightedness and tunnel-vision. One of the main arguments made by those in favour of the arms industry is that procuring weapons is a means of deterrence and keeping the peace. However, we only have to switch on our televisions and watch the news for a minute to see that such arguments are misleading and patently false. Certainly, the thousands of innocent children who have lost their parents, or have lost their own limbs, will never be convinced by such logic, nor will the thousands of women who have been left widowed, or the millions of people who have been displaced from their homes. If we are to leave behind a legacy of hope for our children, and bequeath a peaceful world to our future generations, we, irrespective of our religion or beliefs, need to urgently change our priorities. Instead of being consumed by materialism and a desire for power, every nation, whether rich or poor, must prioritise the peace and security of the entire world above all else. Instead of embarking on an arms race, leading to death and destruction, we must join the race to save and protect humanity. Instead of shutting down borders and ports in warring countries, causing for innocent children to be left starving and the sick being deprived of medical treatment, we must open our hearts to one another, knock-down the walls that divide us, feed the hungry and help those who are suffering. Members of many different faith communities came to the Peace Symposium, during which His Holiness stressed the importance of cooperation. 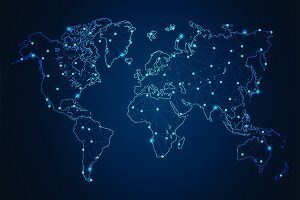 In terms of political rivalries, the dispute between the United States and North Korea continues to threaten the peace of the world and any conflict between the two would also severely impact countries like South Korea, China and Japan. Whilst it is being said in the past few days that there has been a breakthrough, because the President of the United States has suddenly indicated his willingness to meet the North Korean leader, still, there are no guarantees that peace will prevail. It is not even clear under what conditions they would meet, or where and when such a meeting would take place. Even if a deal emerges, God only knows how long it will last, as there is a great deal of hatred entrenched on both sides. The Iran nuclear deal of a few years ago is a case in point, whereby a negotiated agreement was reached between Iran and the West, but now, just a few years later, the deal hangs by a thread. Hence, there are many issues that are precariously hovering just under the surface and any one of them could erupt at any time and the consequences do not bear thinking about. However, Islam teaches that peace can only be achieved when all traces of ill-will and malice are removed from a person’s heart and replaced by a spirit of mercy, love and compassion for others. Islam is often branded an extremist religion that incites violence, and it is also alleged that large numbers of Muslims are disloyal to their countries, or seek to spread disorder within society. However, I consider such allegations to be false and unjust. Even though so-called Muslim terrorists claim to act in Islam’s name, I do not believe that we are witnessing a religious war; rather, the wars being fought and atrocities committed are only for geopolitical gains. The so-called Jihadi terrorists and extremist clerics serve only to tarnish the name of Islam and undermine the efforts of the vast majority of Muslims who are peaceful and law-abiding citizens. Unquestionably, from the outset, Islam has rejected all forms of extremism and the verses of the Holy Qur’an recited earlier tonight provide clear proof of this. These verses tell us that the early Islamic wars were fought in order to protect all religions and preserve the sacred principle of freedom of belief. 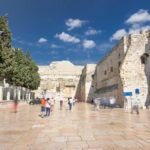 The verses categorically mention churches, synagogues, temples and mosques to be saved. There are many other columns published in recent times by non-Muslims that substantiate the fact that terrorist groups such as Daesh could not have thrived without external support. I am not saying that it is always wrong to intervene, but any action must be fair and proportionate and self-interest must be set-aside. Chapter 49, verse 10 of the Holy Qur’an states that the objective of any intervention should always be establishing long-lasting peace and instructs Muslims to be just even with their adversaries. Thus, where Islam gave permission, as a last resort, to the early Muslims to fight a defensive war, it also instructed them to fulfil the requirements of justice and to never be swayed by vested interests or to transgress once peace was established. 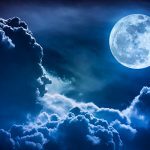 Certainly, this profound principle is just as beneficial today, both for Muslims and non-Muslims alike, that where force is required to stop an aggressor from inflicting cruelty, the action must remain proportionate and never enter the realm of seeking revenge or plundering the wealth of the vanquished. Once the aggressor returns to peace, they should not be deprived of their rights, or taken advantage of in any way. 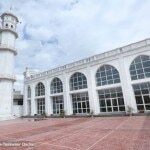 Throughout his life, the Prophet of Islamsa sought to bring people together in peace and was ever ready to forsake his own rights in favour of others. 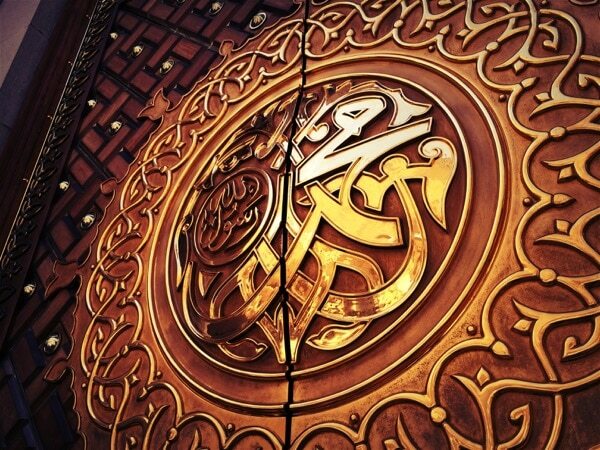 Many non-Muslim writers and academics, who have carefully studied Islam, attest to the fact that the Holy Prophet Muhammadsa sought to unite communities and championed freedom of belief. For example, Peter Frankopan, a Senior Research Fellow at the University of Oxford, has mentioned the Holy Prophetsa in his book, The Silk Roads. 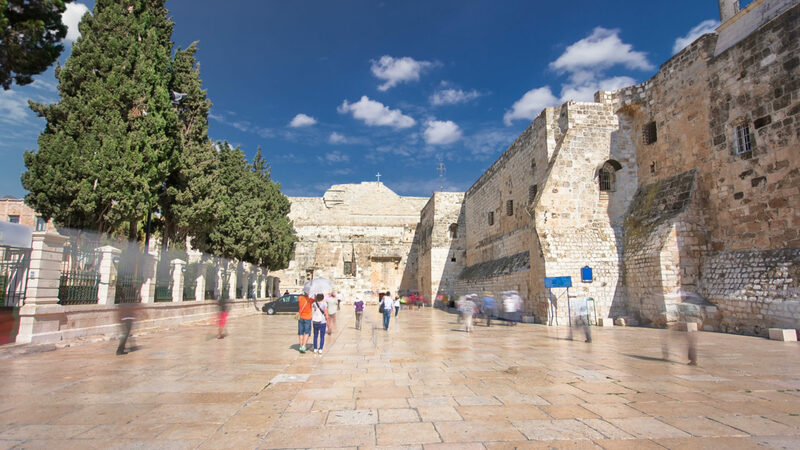 The author explains how the Holy Prophet Muhammadsa sought inter-faith harmony and dialogue and worked closely with the Christian and Jewish communities of the time. Thus, the truth is that Islam has always been diametrically opposed to any form of terrorism or extremism. Furthermore, whilst I accept that the evil acts of some Muslims have greatly damaged society, I do not accept that it is only Muslims who are to blame for the volatility of today’s world. Many commentators and experts are now openly saying that certain non-Muslim powers and groups have also played a role in undermining peace and social cohesion. Suffice to say, that now is the time that humanity distanced itself from the notion, that only Muslims are to blame for the problems in the world. Furthermore, it is also high time, that instead of prioritising the advance of their political parties or governments, our leaders prioritise the future peace and prosperity of humanity. This is the way to bring about true peace in the world. At a broader international level, we must recognise the fact that force rarely leads to any long-term benefit. Thus, when dealing with North Korea, Iran or any other country, the major powers should proceed with caution and wisdom and endeavour to listen to the concerns of each party. As one columnist I quoted mentioned, world powers should pursue diplomacy and prioritise a de-escalation in tensions. They should strive to negotiate peace deals and agreements that are not biased in favour of one side, but that address the concerns of all sides. Furthermore, once peace is achieved, we should let go of any past enmities or hatred and march forward together with a spirit of mutual respect and regard. Certainly, it is my firm conviction and belief that the single greatest example of forgiveness, benevolence and mercy in the history of mankind is the blessed example of the Founder of Islam, the Holy Prophet Muhammadsa. For thirteen years, he and his followers, were subjected to the most brutal persecution imaginable and were driven out of their homes and forced to migrate from the city of Makkah. 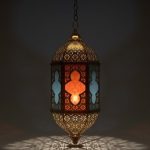 During that period, the Muslims were brutally martyred, physically and mentally tortured and subjected to the harshest possible social deprivation. Muslims were forced to lie directly upon burning coals for long periods. Muslim women had their legs tied to different camels that were then made to run in opposing directions, literally wrenching their bodies into two separate parts. 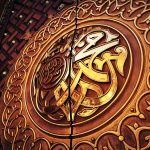 Yet, when the Holy Prophet Muhammadsa returned victoriously to Makkah, he did not take a single drop of blood in revenge; rather, according to the command of Allah the Almighty, he proclaimed that all of his tormentors and all those who had violently opposed Islam, were to be instantly forgiven. He declared that under Islamic rule, all people would be free to practise their own religions and beliefs, without any interference or cause for fear. His only condition was that each member of society remained committed to peace. He instructed that all people, no matter their caste, creed or colour, were to have their rights protected and be treated with respect at all times. This was the timeless and magnificent example of the Prophet of Islamsa and it is this spirit of compassion, grace and mercy that Muslims and non-Muslims need to adopt in the world today. It is this spirit of forgiveness and benevolence that all nations, whether large or small, rich or poor, need to develop. Only then will long-term peace be attainable. With all my heart, I pray that mankind comes to recognise its duties to one another, so that those who follow us remember us with pride and gratitude. Let us look to tomorrow and not just today. Let us save our future generations. May Allah grant us wisdom.